April 26, 2018: FiLS provided STEM activities for the children of the National Science Foundation staff for the annual Take our Daughters and Sons to Work Day. Activities included glow-in-the dark germs and microscopy stations. The students were able to identify the areas of their hands that they commonly forget to clean thoroughly as they wash their hands. At the microscopy stations they examined their cheek cells and plant cells using traditional light microscopes and Foldscopes. April 14, 2018: FiLS presented an introductory microscopy workshop to the students of the Health Occupation Program (HOP) at Howard University. The students are 9th graders from the Washington DC, Maryland, and Virginia area. 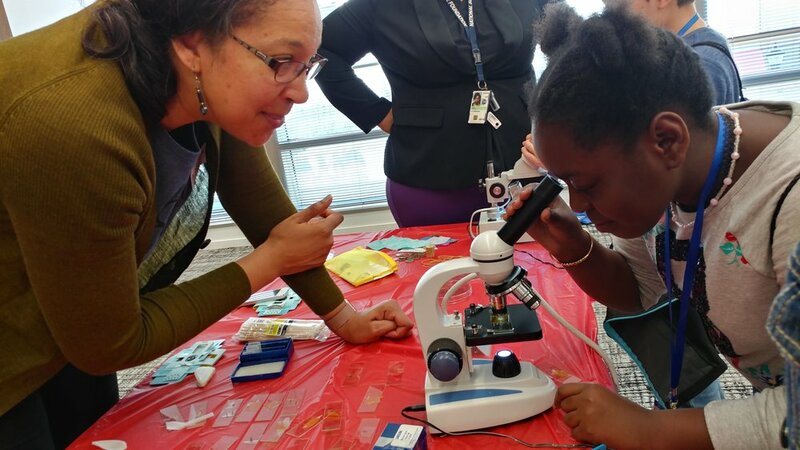 In addition to learning a brief history of light microscopy, the students were able to use traditional light microscopes and paper microscopes called Foldscopes to view their own cheek cells, plant leaf cells, and onion cells. The power of microscopes is that they bring the invisible world into view. The workshop was developed by Drs. Nadeene Riddick and Christopher Williams and was presented alongside Dr. Marguerite Matthews. All three scientists are current AAAS Science and Technology Policy Fellows. 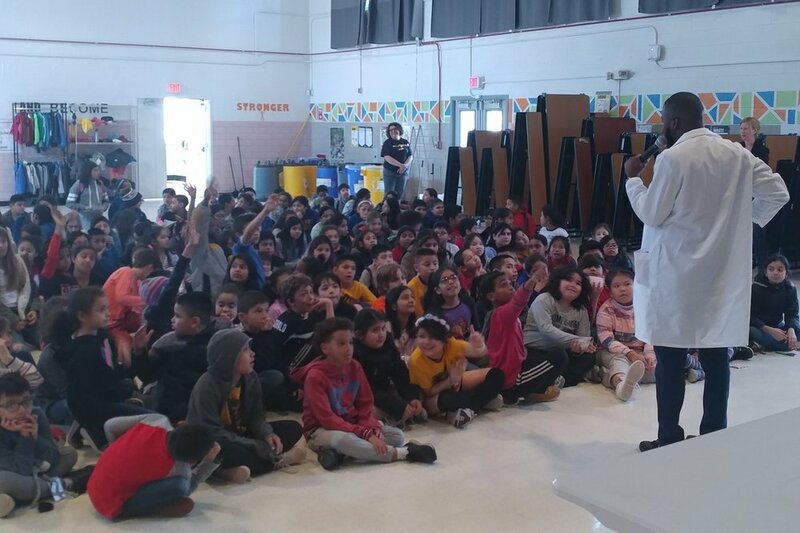 April 5, 2018: The 3rd and 5th graders at Bancroft Elementary School received a very special visit from Mr. Austin Jordan of the Center for the Advancement of Science in Space (CASIS). He provided an unforgettable experience for the students, where they experienced a small taste of astronaut life in space. The students saw a rocket launch, learned about the science experiments conducted on the International Space Station, and slept like an astronaut. CASIS is the manager of the International Space Station U.S. National Laboratory. The mission of CASIS is to maximize use of this unparalleled platform for innovation to benefit life on Earth. December 16, 2017, Hello everyone! The FiLS family wants to share some great news! The First Life Science Program is officially a federally recognized tax-exempt 501©3 non-profit organization. Donations to FiLS are tax deductible. On July 17, 2017, The FiLS Program participated in the STEAM After Dark event held at Clifton Park Baptist Church in Silver Spring, MD. FiLS partnered with Science Education Academy and Clifton Park Academy to provide an action-packed evening for students in grades Kindergarten through 12th. A student favorite: strawberry DNA isolation. The volunteers having a little fun! On June 8, 2017, the FiLS team provided magnificent and magnifying STEM fun for students and parents at the Mount Vernon Pyramid STEM + Families Event in Alexandria, VA. Gaining a new view of the world. Seeing the world in a completely new way! FiLS volunteers Rhea and Christina, ready to WOW the kids! On May 20th, 2017 FiLS provided hands-on STEM activities for roughly 40 K-6th graders at the Gum Springs Community Clubhouse in Alexandria, VA.
On May 11th, 2017 FiLS participated in Bancroft Elementary School's Science Night in NW Washington, DC. Dr. Sweta Batni and Dr. Christopher Williams pose with a student at Bancroft Science Night. On April 12th, 2017 FiLS partnered with Turning the Page for one of their Spring 2017 STEM Night. The event was held at Patterson Elementary School, in SW Washington, DC. We are back at Bancroft for the second half of the 2016-2017 school year. We are combining Science and Engineering lessons with popular culture to give the students a STEM experience they will always remember. Even though the Pokémon cartoon hit the U.S. almost 20 years ago, it remains one of the most popular cartoons for elementary school students. To see more updates on the activities the students complete during the school year please check out News and Updates. We are also proud to introduce our newest volunteer with the FiLS Program, Dr. Izumi Hinkson. Izumi Hinkson is an American Association for the Advancement of Science (AAAS) Science and Technology Policy Fellow. She earned her doctoral degree in Chemical and Systems Biology from Stanford University where she lead a K-12 STEM education volunteer organization. Izumi is passionate about STEM education, specifically chemistry and biology. In her free time she enjoys playing and watching soccer. Thank you to our supporters! These supplies will be used first for our Human Senses: Sight module. We were able to purchase a number of scopes (dissecting scope, microscope, binoculars, and a monocular) with your support. The students will LOVE these! The Winter session at Bancroft Elementary School begins February 4th, 2016. A student gets his first look at a plant cell at Bancroft Elementary School. In October 2015, The FiLS Program kicked off its first partnership, at Bancroft Elementary School in Washington, DC. FiLS provides free after-school Biology programming for the seven 5th graders from the dual language (Spanish and English) elementary school. We meet once per week for 6 weeks (October 15th through November 19th) while they explore the world of plant biology.